When it comes to pokie machines Ancient Egypt is always a popular theme. Think Queen of the Nile, King of the Nile and Pharaoh’s Tomb. This online pokie Throne of Egypt online slots stands apart from the rest, as it offers fantastic graphic symbols, along with a rewarding bonus game that can bring you big bonus jackpots. 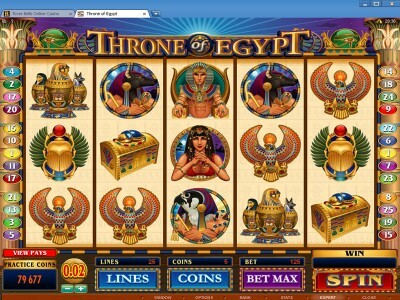 Throne of Egypt is a 5-reel 25-payline pokies game featuring the mighty pharaoh and his beautiful queen. Other symbols are beautifully illustrated and feature a falcon, the jackal-headed man-god Anubis, sarcophagus, Egyptian Coptic jars, the eagle, and the golden scarab. The Throne of Egypt Logo substitutes for all others and is the wild symbol and also appears stacked on the reels, resulting in big payouts. The Cobra Lantern is a scatter symbol and is key to winning big. Two or more Cobra Lantern symbols scattered anywhere on Reels 1 and 5 instantly provides 15 free spins with 2x winnings. The fun doesn’t stop there with 2 of the Eye of Horus symbol landing anywhere on Reels 2, 3, and 4 providing access to the three-chambered Bonus. Inside the first chamber you can pick scarabs until you find the Golden Keywhich can open the door to the next chamber. In the next room 9 royal eagle jewels are protected by two Falcon guards. You get to pick three eagles for big rewards and a chance to find the key for entrance into the final chamber. The third Bonus Chamber is the King’s Chamber, and you can select one of the princes for a final payout. If you love ancient Egypt inspired online pokies then Throne of Egypt is for you. Enjoy the demo game to learn more or play with real money at online casinos.